Panacur Granules for Dogs & Cats treats against gastrointestinal roundworms (nematodes) & Giardia protozoal infections. 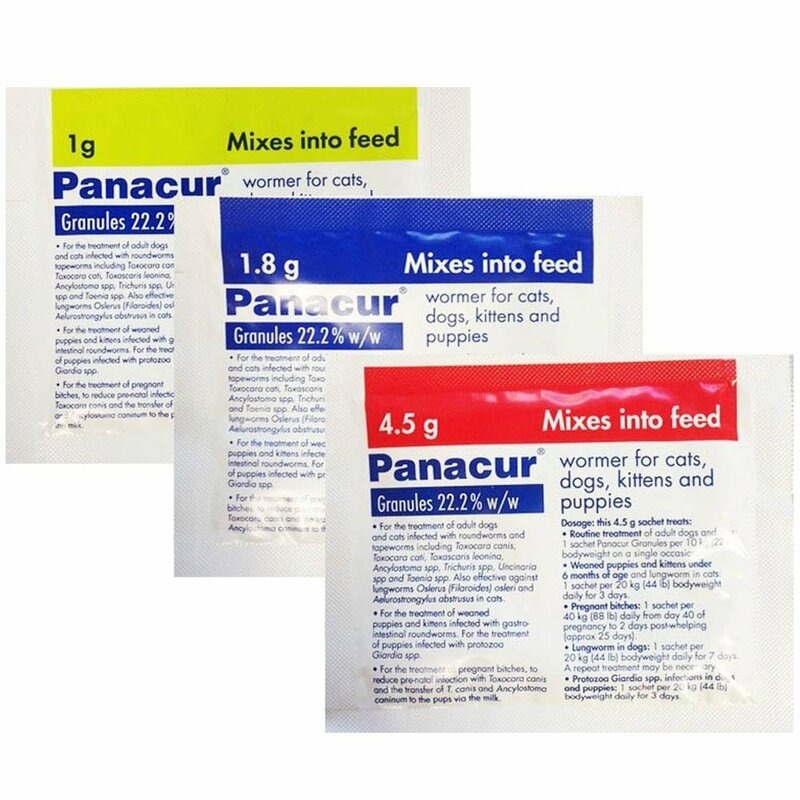 Panacur Oral Granules for Dogs & Cats, treat against all types of nematode worms, including ascarids, hookworm & whipworm (it doesn't treat for tapeworms though). Worms can be a serious threat to your dog or cat's health & wellbeing, so routine worming every 3 months is essential. To treat adult cats & dogs for worms, give as a single dose: 1g sachet treats an animal weighing 1.1-2kg. To treat puppies & kittens under 6 months of age weighing 2.2-4kg, give half of the above adult dose daily for 3 consecutive days. Giardia infections can cause diarrhoea & are more common in puppies than adult dogs. Panacur Granules can also be used to treat Giardia. Warnings & Contraindications- Do not use on animals who are less than 2 weeks old. Pregnancy & Lactation- Can safely be given in the last trimester of pregnancy, but seek advice from your vet before giving in the first two trimesters.